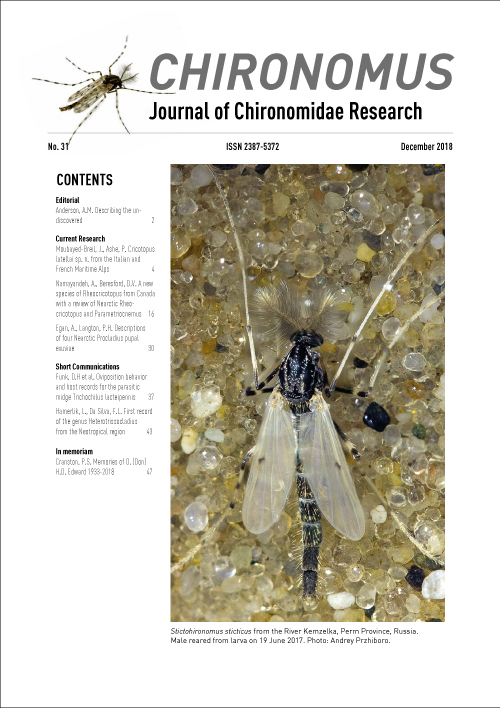 The CHIRONOMUS Journal of Chironomidae Research is devoted to publishing peer-reviewed research articles related to all aspects of chironomid research. The journal also serves as an updated news bulletin for the Chironomidae research community. The journal has one issue per year, but articles are published online continuously after they are accepted. The journal is open access, and can be downloaded freely from this website. All research articles submitted to CHIRONOMUS Current Reseach section are subject to peer-review. There are no page charges for manuscripts accepted for publication.